Brazil has been portrayed in the Anglo-American world as either one of the BRICS countries, emphasising its rising power status, or as the country which most colourfully and exuberantly celebrates its Carnival. Now that the country is in the midst of a political and economic crisis, you would have thought that it can always count on Carnival to fall back on as a relief – that 4-day period in which, every year, people set aside all their troubles and forget about all the issues and constraints of their everyday life. Well, no. Not this year. The celebration of beauty and glory that typically characterises Rio’s legendary parade was replaced this year by an unprecedented show of criticism: for the first time in history, Rio’s Carnival took a deeply politicised turn. The 2018 parade, and the ensuing response to it, raises some important questions about current Brazilian politics. The origin of Carnival in Brazil dates back to the age of the Portuguese empire, when the entrudo was celebrated by the first Portuguese settlers. But it changed over the years. After the country’s independence, Rio’s elite decided to disconnect from the “outdated” Portuguese ways and come closer to the new European capitalist powers style of doing things by importing the Parisian Carnival ball. This year, what prevailed at Marques de Sapucai Avenue was something completely different: the representation of ugly, the bad, the problematic aspects of the country. They called this shift the “civilising” of Carnival. In 1932, the official samba schools competition was created and the parade became a wondrous performance. This is the way it works: each samba school chooses a theme for the forthcoming parade and works throughout the year at putting up a highly glamorous 50-minute show on the chosen topic. Topics chosen normally honour national heroes, enhance the country’s virtues, or praise its human and natural resources They take the form of epical stories told in samba-enredo verses and represented by costumed casts and parade floats. The samba school Beija-Flor de Nilopolis, for one, portrayed Brazil as a monster. It set aside traditional luxury and focused on social criticism, revealing the “monsters” within current Brazilian society. They drew inspiration from Mary Shelly’s literary classic Frankenstein, published for the first time 200 years ago, and offered reflections on social ills such as corruption, violence and intolerance – the ugly beasts that torment contemporary Brazilians. Their first float was a representation of Frankenstein’s birth in a caravel, a metaphor for the origin of the monster that Brazil has become. The school portrayed the country as a patchwork, drawing a clever parallel with Frankenstein’s nature, made out of different body parts forcefully stitched together. Another samba school, Paraiso Tuiuti, questioned the assertion that slavery is over in today’s Brazil and brought to the Marques de Sapucai parade a samba-enredo titled My god, my god! Is slavery extinct? (paraphrasing a famous quote of abolitionist Jose do Patrocinio when the Lei Aurea was signed, which Paraiso Tuiuti recast as a question). The topic it chose was the exploitation of man by man, coinciding with the 130 years anniversary of the abolishment of slavery in Brazil, for which the school put up a powerful show describing the pain suffered by the enslaved Africans who were forcibly taken to Brazil, connecting historical facts to current political events. The Comissão de Frente school’s performance used a mocking tone to attack the pension funds reform proposed by President Michel Temer and to criticise the 2016 pro-impeachment demonstrations in a section of the school’s parade entitled Os Manifestoches (a contraction of the words puppets and protesters), which was formed by pro-impeachment protesters (whose main claim was the fight against corruption) wearing Brazilian Football Confederation – famous for its corrupt management – shirts, controlled by big hands in suits representing right-wing politicians. The icing on the cake was Michel Temer, represented as a vampire sucking the blood out of the population – which the crowd enthusiastically cheered chanting the classic Fora Temer (out with Temer) slogan. 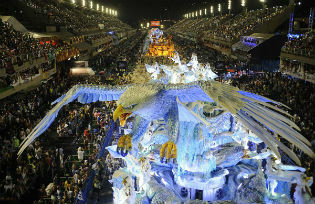 These were the samba schools that came on top in the competition. They all shared an extremely critical view of the country (its racial history, its current leadership, its image), which is something far removed from the traditional celebration of national glory that used to characterise the parade. Several other schools also included political criticism at some point. The Mangueira school, for instance, recycled last year’s materials in order to criticise the cuts in Carnival funding carried out by the Mayor of Rio. The Salgueiro school addressed the issue of racial and gender politics by representing the history of Brazilian black women. And the Portela school chose the issue of refugees. Despite the big popular impact of this new approach to Carnival, Brazilian mainstream media did not cover it nearly as much as the international media did. There is no denying that, this year, the Carnival in Rio became a site for resistance and subversion. Russian philosopher Mikhail Bakhtin would have said that this year’s Carnival was genuinely and primarily Carnivalesque, for it became a tool of political contestation through humour and customisation. If political leaders make a mockery of politics, then the people mock them in return. The Mangueira school, for instance, recycled last year’s materials in order to criticise the cuts in Carnival funding carried out by the Mayor of Rio. The colourful display of resistance not only challenged the current political status quo, but also confronted the post-racial narrative of Brazilian national identity – that is, the widely accepted narrative according to which Brazil, unlike the US, is a racial democracy. How did the government take it? Making an authoritarian stand and putting the army officially in charge of public security in the state of Rio. A presidential decree, which was endorsed last week by Congress, gives the army overall control over security operations in the state, which means that every decision regarding public safety in the state is now in the hands of the military rather than in the hands of the democratically elected (albeit flawed) government, until next December 31. We should bear in mind that Brazil has witnessed a fair number of chaotic political developments over the last two years: the Lava-Jato corruption scandal; the controversial impeachment process of the first-ever woman president; the prison system crisis; the continuing spread of police corruption; a number of setbacks in progressive legislation (the ban on unlimited abortions, the potential loss of social security coverage and pension rights, the loss of indigenous and afro-Brazilian communities’ property rights, the comeback of religion as a subject in the schools’ syllabus), to which should be added former president Lula’s conviction for alleged corruption and money laundering and the creation of the Ministry of Public Security, officially announced on February 26. This year’s Carnival is important in so far as it demonstrates how a mass show can become a stage for political criticism at a crucial junction in the country’s history, marked by a divisive brand of politics and the rising of the Right – embodied by leaders who, like Jair Bolsonaro, are known for their reactionary, homophobic, racist and sexist views and their advocacy for restrictions on free speech and other civil rights. Bolsonaro’s popularity is an indication that such views are becoming legal tender in the country, where intolerance towards diversity is on the rise – as shown by the recent demonstrations against American philosopher and gender theorist Judith Butler’s visit, the cancelling of art exhibits, and drawbacks in almost every sphere of public and community life. It can be argued that, to some extent, this is part of a global trend. Brazil’s current predicament shares several features with what is happening in other parts of the world, where a new brand of authoritarian leaders are gaining ground. And where parades as shows of national identity are becoming more important: it is no coincidence that Trump has ordered plans to be drawn for a military parade, styled on the Bastille Day’s in France, to reflect the US’s cherished idea of itself – quite unlike what happened in Brazil this year. In Brazil, the show was subverted and subversion was met with repression from the authorities. For it should be recalled that Brazil – like most countries in similar circumstances – has experienced and experiences a difficult transition from military rule to democracy. It is in the light of this that we should consider the fact that the army is now making a comeback in an administrative role in Rio, and that a brand new Ministry of Public Security is being created. What does this mean in terms of the presidential and state government elections which are due in October? Is it a mere show of “strong”, “effective” action by the current government aimed at luring voters? Or is it a consolidation of Bolsonaro’s views on how to run the country? The coming months will be crucial as the forces of resistance and of authoritarianism will be increasingly pitched against each other and thus pose a challenge for the already faltering Brazilian democracy. Eduarda Fontes is a doctoral researcher at the Department of Politics and International Relations of the University of Westminster.